A small group of architects in Chiang Mai is working to preserve Lanna-era temples and revive the architectural style in modern buildings that serve as upmarket hotels and resorts. 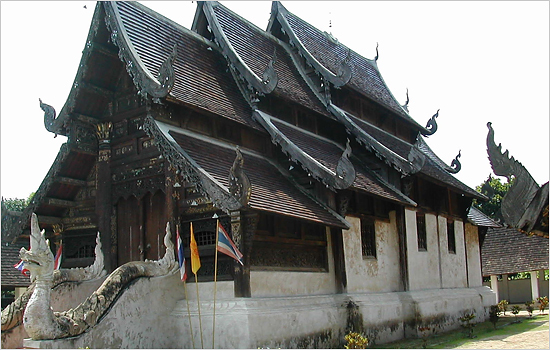 Many of the Northern Thai temples, which are characterized by steeply pitched, multi-tiered roofs, and small doors and windows, have fallen into disuse and disrepair, suffering from years of neglect by municipal authorities and a lack of enforcement of laws to protect heritage monuments. Also, about 70 percent of the temples in Chiang Mai are rented out to the poor or have been put to commercial use in some capacity. "This is our identity; we have to conserve it, otherwise we will have nothing to be proud of," said Vitul Lieorungruang, an architecture professor at Chiang Mai University. "A place that becomes completely modern doesn't know who it is anymore."